Head East of Abu Dhabi and in about two hours you’ll hit Al Ain. Looking for things to do there besides kart? Looks like this guy’s site probably has you covered – Al Ain Enthusiast. How did I get to Al Ain? There is a bus route, although I wanted to do with my time as I pleased and picked up a car locally as I described in renting a car in Abu Dhabi. Track: The Dubai Kartdrome (Outdoor) and Al Forsan International Raceway are both pretty big and serious tracks – 1.2 km. However, Al Ain is even longer at a massive 1.6 km! That’s a full mile for my fellow US friends. Karts: Al Ain has some pretty awesome rental karts. They include steering wheel mounted information screens to let you know how you’re doing, which is awesome and something I’ve never seen on standard arrive and drive rental cars before. 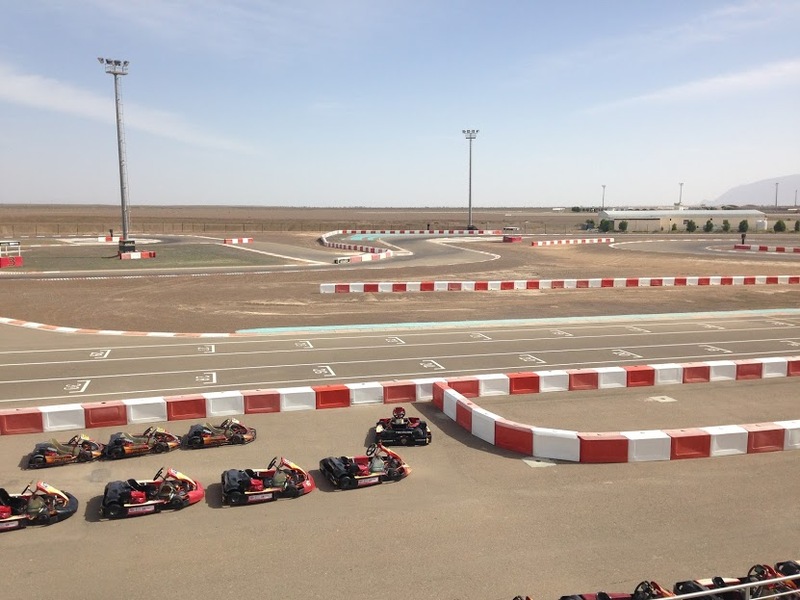 Al Ain also has rotax for rent – although you’ll need a UAE kart racing license for that, or they may let you rent one if you express interest and a marshal signs off on your driving. They’d also prefer a heads up the day before your arrival if you plan on renting a rotax. I believe the entry level karts are 270cc 4-strokes, with no display on the steering wheel, with the next step up being 390cc? I only had time to do 2 races here, the place was very busy with actual race classes the day I went. Unfortunately my faster kart time got broken up – I broke the seat. You could blame me being a fat American but I’m sure the real problem was the kart just could not handle my speed. Timing: Of course, modern electronic timing system plus the awesome displays on the karts! Videos: First the regular kart and then the faster one. The course is so long/large/wide that you barely need to use the brakes on the standard rental kart, I was still trying to figure out how much they were actually necessary. It’s noticeably lacking in power for such a large course. I would recommend any fellow karters start with the next one up if they can start directly from it.